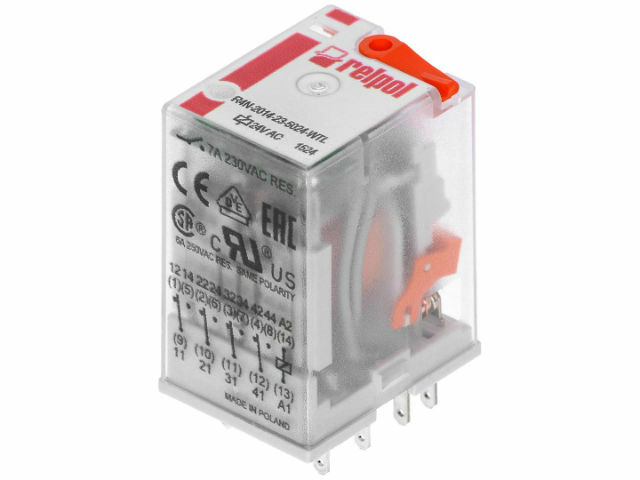 The new series of R2N, R3N, and R4N industrial relays from RELPOL is a modernisation of the well-known and proven R2, R3, and R4 electromagnetic relays. The new RELPOL relays have identical pin configuration and technical parameters as the R2, R3, and R4 relays from the previous series. Relpol’s upgrades of their production technology enabled them to achieve higher performance of the electromagnet, add a new functionality of mechanical flag indicator, strengthen the insulation, improve reliability, and come up with a modern design. Besides the standard indicator and a test button with the lock function, the relays can be equipped with an LED light indicator or an overvoltage suppression diode. The R2N, R3N, and R4N industrial relays give you more possibilities of creating circuits in comparison with traditional 1-or 2-pole components. You can e.g. simultaneously connect a three-phase circuit and signal that. TME’s offer also includes compatible sockets for these relays.